Teaching Authors--6 Children's Authors Who Also Teach Writing: Of Thanks and Thankus! Say the word Thanksgiving and right away, I’m gathering my favorite newspaper recipes – Mom’s Foolproof Turkey from a 1989 Chicago Tribune, Do-ahead Mashed Potatoes that are the stuff of any cardiologist’s dream, Cooked Cranberry Orange Relish that always surprises. But now I have a new favorite holiday recipe, non-fat and non-caloric, yet nevertheless delicious: a Thanksgiving Thanku, a thank you note in the form of a haiku. Expressing gratitude has never been easier. Post it as a comment to any of our blog posts through Nov. 30. Send it to us via email to teachingauthors at gmail dot com, with "Thanks-Giving" as the subject. Depending on the number of emails we receive, we'll share some of your notes in our posts. Post it on your own blog and then share the link either via a comment or email. 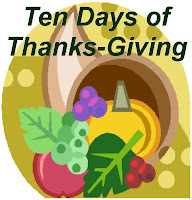 On November 30, Carmela will post a round-up of all the links we receive. The recipient of my Thank You Note today? One Barbara Lucas, Writer, Teacher, Editor, Publisher and Mentor Extraordinaire, Founder in 1983 of the one-week summer Vassar College Institute of Children’s Book Publishing and Writing that changed my Life. I (bravely) attended the Institute in 1989, 1990, 1991, then again in 1993 (as a presenter) and finally in 1995, as a celebrant of the Institute’s 15th Anniversary. I’d be neither an Author nor a Writing Teacher had Barbara’s path and mine not crossed. Barbara got her start in publishing at Harper and Row, as assistant to the legendary Ursula Nordstrom. She was Editor-in-Chief at Putnam and then at Harcourt, Brace and Jovanovich, when the publisher had all 3 names. She and Artist’s Representative Dilys Evans began and oversee Lucas-Evans Books, a book packager. Institute mornings from 9 am to noon, I learned my craft, sitting at Barbara’s feet, and those of her fellow teachers – authors M.J. Auch, Marge Facklam, Stephanie Tolan, Patricia Hermes and Jean Marzollo. They taught me the elements of writing and the tenets of writing for children from my fellow attendees’ submitted manuscripts. Afternoons and evenings, we met invited guests, key members of the Children’s Book World who traveled up the Hudson from New York City to Poughkeepsie: editors, publishers, art directors, marketing specialists, academicians, librarians, agents, book reviewers, authors, illustrators. In between sessions and long into the night, we writers connected, forging a community. It was Barbara who shared: I was writing above my plotline, not plugged into my characters; how could my readers connect with the story? It was Barbara who believed in me, gifting me with a classroom poster of Troy Howell’s Original Art, a poster that now adorns the wall above my desk. It was Barbara who introduced me to my Children’s Book World’s residents and showed me my story was but the Very First Step in a book's creations. So many hands touch that book before the story can touch the reader. The wonder of Barbara is: I am but one of so many children’s book writers and illustrators lucky enough to have reason to write the above Thank You Note. Barbara empowered us so we could go forth and empower our readers. I pay her Kindness forward each and every time I help a writer. I model her instruction, each and every class I teach. to meet those who stretched a hand. They showed us the way. For the record, I have indeed expressed my gratitude to Barbara on numerous occasions over the years. But one can’t say “Thank you!” enough. I join my fellow TeachingAuthors in wishing our readers Happy Thanksgiving! Esther, your Vassar Institute experience sounds a lot like the VC MFA program. I feel blessed to be one of the writers you've so generously "paid forward" to. How I wish I had been with you all those years at Vassar Institute! Your obvious love and admiration for Barbara shines in every sentence, Esther. Dog Poems for Poetry Friday! Kidlitosphere Interview Wednesday is Here Today!